The camera has a pleasing design—the result of a partnership with design company IDEO—and measures 4.35 x 1.35 x 1.12 inches (11 x 3.5 x 2.8 centimeters). That makes it a little taller than, say, the Ring Video Doorbell, but it is more compact. The white faceplate is removable, but at present other colors aren’t available on the SimpliSafe website. A version on BestBuy’s website includes them in white, jade and black. 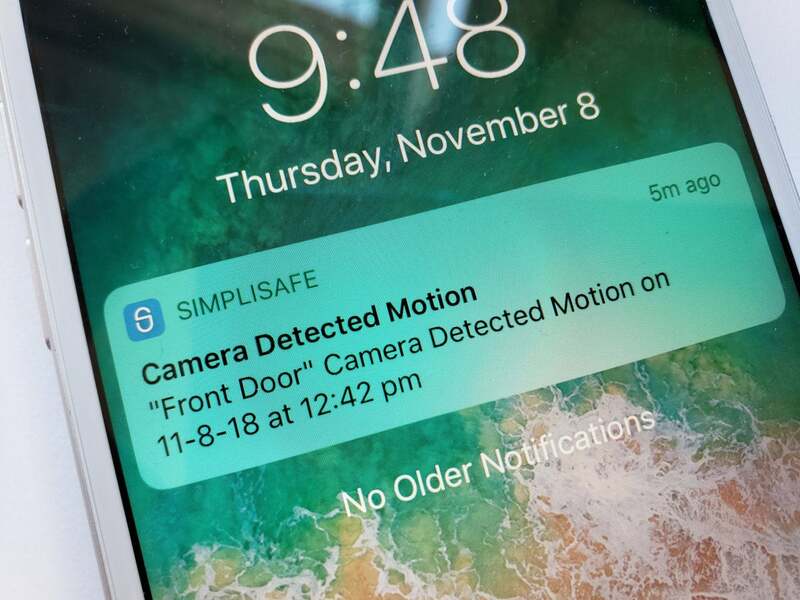 If you have one of SimpliSafe’s second- or third-generation home security systems, the camera will start recording when any security sensor is triggered. But as a stand-alone unit, it isn’t compatible with other security systems or with smart speakers, such as Google Home or Amazon Echo. The SimpliSafe Video Doorbell Pro features attractive industrial design. The picture from the doorbell is good and better than most. It shoots in 1080p high definition and the camera’s support for HDR (high dynamic range) was immediately obvious when I installed it. The dark overhang above my porch was well exposed without the rest of the image being washed out. The field of view is 162 degrees, so it gives a nice, wide view of what’s happening in front of your house. This view from the SimpliSafe doorbell shows the advantage HDR video provide. The nighttime infrared image was also good. A nighttime view from the SimpliSafe Video Doorbell Pro. The doorbell has just four settings for motion detection: off, low, medium and high. It uses an infrared sensor to detect movement, so it’s looking for heat sources. This can be a person, an animal or a truck driving down the street. SimpliSafe is promising to add image classification in the future, to determine if the detected object is a person or not. That should make its alerts more accurate, but in the meantime I found the low setting worked for me. Any higher and passing vehicles triggered the detector. There is no ability to add detection zones: The camera monitors the entire image or none of it. 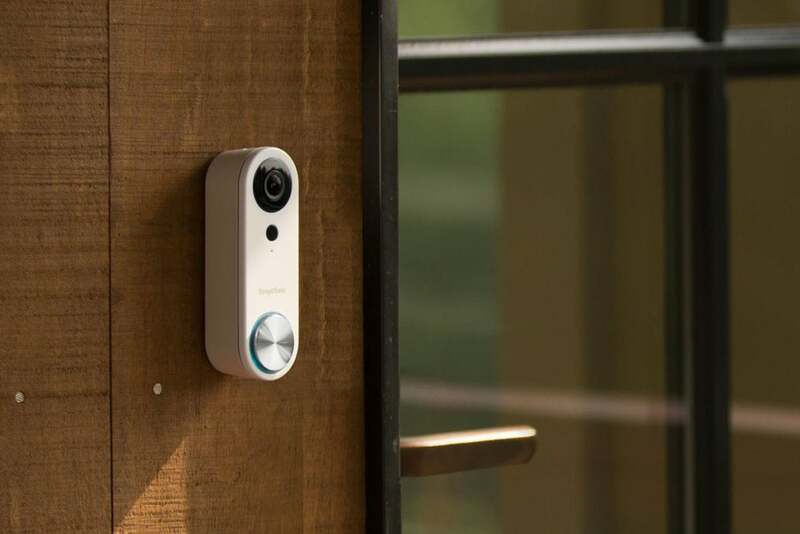 One of the selling points of SimpliSafe’s video doorbell is that you don’t need a subscription for basic functions to work, and that’s good news. Without paying the $4.99-per-month fee, the doorbell’s app will pop up an alert on your phone when the doorbell senses movement or when someone presses the bell button. You can pull up a live video view and talk remotely to the person in front of your door. A SimpliSafe notification on an iPhone. Take a closer look at that screenshot and see if you notice anything strange: Yes, the motion detection appears to have taken place in the future. The notifications are set to Eastern Standard Time and my phone is on Pacific Standard Time. SimpliSafe says it’s a known issue and should be corrected soon. Interestingly, it only affects the notifications. The timeline of events was displayed correctly in local time. If you’re on the free service, you won’t get video recording. Unless you catch something when it happens, you don’t have the ability to go back later and see what caused the doorbell to alert you. 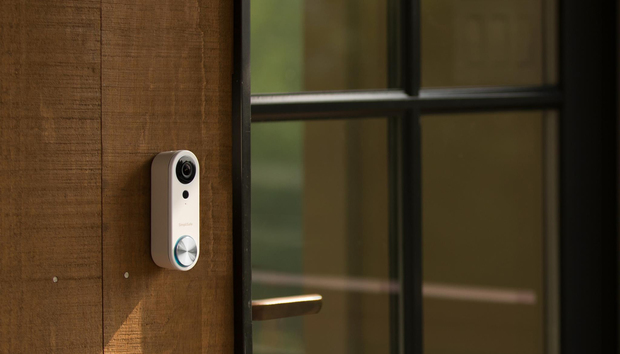 If that’s important to you, work in the cost of the monthly subscription when evaluating doorbells, or choose one with recording and no monthly fee. TechHive has a guide to the best subscription-free smart home products. The Video Doorbell Pro sits on a plastic bracket that is screwed into the wood or brick near your front door. SimpliSafe provides a plastic wedge to help you better angle the doorbell if you have shingles or something else that means the front of your house isn’t plumb. You’ll need existing doorbell wiring. The unit is compatible with 8-24 power supplies (i.e., 8 amps, 24 volts). 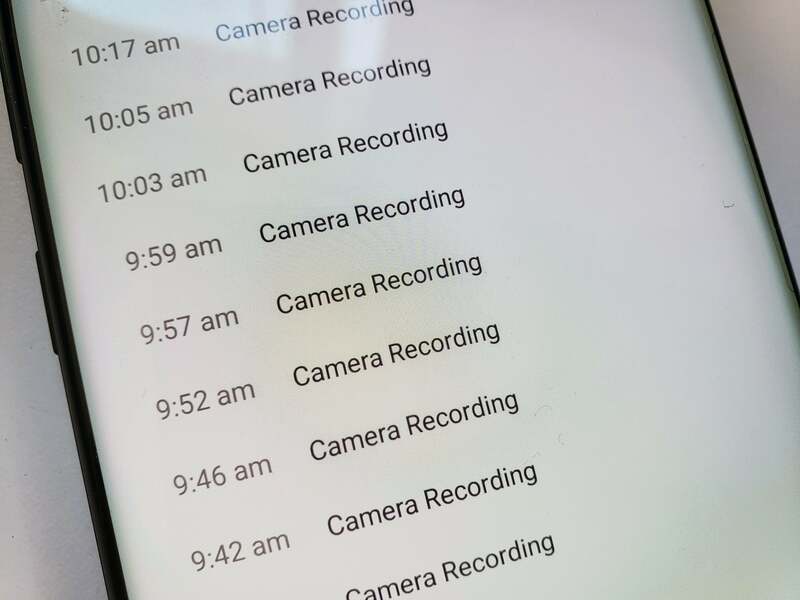 I’ve installed a bunch of video doorbells for testing and the SimpliSafe wireless connection process was a new one. Usually you must connect your smartphone directly to the doorbell via Wi-Fi or Bluetooth, juggling connections in your phone, so you can program it with details of your Wi-Fi network. Not so with SimpliSafe. Information on your Wi-Fi network is entered via the app and then the app displays a QR Code. You hold the QR Code up to the doorbell camera and it reads the data and connects to Wi-Fi. I decoded the QR Code and sure enough it contains the name of my Wi-Fi network and the password. This is a neat way to do it because it avoids the clunky switch between connections on your smartphone. When I first installed the app I wasn’t getting notifications. I spent an hour on the phone with SimpliSafe trying to solve this mystery (it turns out it was old data left on my phone from a previous install), and the support was great. The representative I spoke to was helpful, patient, and went back multiple times to try and solve my problem. The only strange part was my initial call. I dialed the phone number printed in the instructions and it turned out to be nothing but spam. “Special offer” after “special offer” with no sign of ever getting to the support center. I eventually gave up and searched for a different number. It turns out that someone has squatted a number similar to SimpliSafe’s, but with the two last digits reversed: 57 instead of 75. They even have the caller ID programmed to read “Home Simplisafe Security” to trick people who misdial. In this case, however, the mixup wasn’t by a SimpliSafe customer, but by whoever wrote the printed installation guide. The company needs to get this reprinted if it wants to avoid customers getting taken in by such scams. The SimpliSafe Video Doorbell Pro is a quality entry into a competitive field. The picture is top-notch, the design is pleasing, and the app is stable. A few minor concerns—such as the notification time zone problem—are promised to be fixed soon. The absence of wider smart home support, on the other hand, is a significant downside. Ultimately, this is a product that will be most appreciated by people who either currently have a SimpliSafe system, are planning to buy one, or people who want to operate it as a stand-alone unit without further smart home integration.